BRING HORSES, CARS OR BOTH! 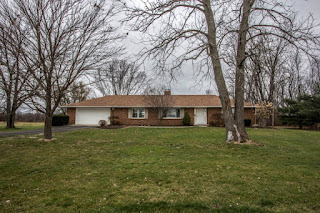 Totally remodeled all Brick Ranch with approximately 2,200SF on 5 scenic acres with trees and a 36 X 48 four stall barn! Just move right in! Remodeled, fully applianced Kitchen with white cabinets and granite countertops. Master Suite has his & hers closets, private, remodeled Bath and sliding doors to a patio. See-through fireplace between the Family Room and Living Room. 1st floor Laundry. New interior doors, interior paint, carpet, flooring, hardware, lighting, remodeled Kitchen, Baths, newer roof, windows, water heater and more! The perfect home in a great location! 3 BRs & 3 Baths. Big Walnut Schools. Only $334,900! Call DeLena today!